By criteria you select—for example, activity shared with a certain user, related to a certain point of Contact, or reflecting a certain type of event. You can use a preset quick filter or select options to create a custom filter. Open the Stream view for a List object by clicking the object name in either the Grid view or the Stream view for the full List. In the Fields tab on the right side of the Stream view, a Filter fields box is displayed. Enter the field name in the box. 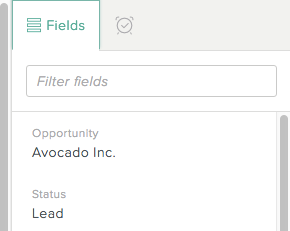 The Fields tab automatically displays any fields that match the term you entered. Note: The results include any filter that matches the term you enter anywhere in the filter name. For example, entering St returns both Status and Last Communication. At the top of the Stream, click . Select a quick filter option from the drop-down menu. Check one or more boxes to create a custom filter. 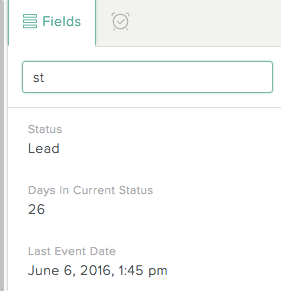 You can filter by type of event, user, or point of contact. If you create a custom filter, you can check any number of boxes—including multiple boxes under the same category—to fully customize the filtered view. To quickly uncheck all the boxes, click Clear all filters. To change your filter criteria for the Stream you are viewing, click Edit. To remove all filters from the Stream view, click Clear. The filters apply to the current List object Stream only, while you are viewing that Stream. If you open another List object Stream or close and reopen the current Stream, all filters are off. 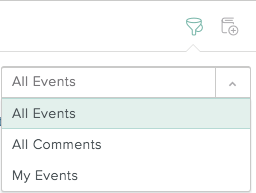 If any new activity takes place in the List object Stream, it appears at the top of the Stream even if the activity doesn't meet your filter criteria. This keeps you up-to-date on current activity even in a filtered view. For example, if you have set a filter to view comments only and a new email arrives, the email appears at the top of the Stream.